Three-time Super Bowl champion, five-time Pro Bowl selection and described by Sports Illustrated as, "One of the hardest hitters in the NFL," Darren Woodson is one of the greatest players to ever wear a Dallas Cowboys uniform. Woodson's athleticism, aggressiveness, and capacity to produce in the big game – paired with his character, leadership skills, and dependability – put him in a select level of performers in the NFL and secured Woodson an elite position in the Dallas Cowboys' Ring of Honor. 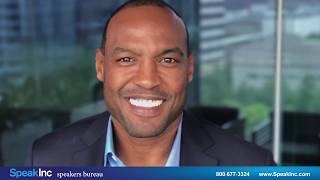 A native of Phoenix, Darren Woodson was named by ESPNRISE.com as one of the best high school players to ever come out of Arizona. He walked on at Arizona State University where he earned a Bachelor of Science in Justice Studies and built a reputation on the team as a ferocious hitter with a keen eye for the art of football. After the Dallas Cowboys selected Woodson in the second round of the 1992 NFL Draft, he quickly became one of the best safeties in the NFL and arguably one of the franchise's best defensive and special teams players (second in team history with 134 tackles). In 2002, he broke the Cowboys career tackling record playing against the Seattle Seahawks but was overshadowed when Emmitt Smith set the NFL career rushing record during the same game. After missing the 2004 season due to a herniated disc, he officially announced his retirement in December 2004 as the team's all-time leading tackler. At the press conference to announce Woodson's retirement, Bill Parcells, former head coach of the Cowboys, said: "[Woodson is] the kind of guy that makes this profession something that you like to engage in. He's the epitome of a professional." Cowboys owner Jerry Jones added: "For 13 years, [Woodson] was everything you could ask for — unselfish, reliable, dependable, a team player first and a team leader always. He's a living, breathing example of the saying that ‘character does matter.'" In recognition of his outstanding career, Woodson was inducted into the Arizona State University Hall of Fame (2005), the Arizona Sports Hall of Fame (2009), the prestigious Cowboys Ring of Honor (2015), and the Texas Sports Hall of Fame (2017). Since his retirement, Woodson has worked as a football analyst for ESPN, appearing on NFL Live, SportsCenter, and First Take. In addition to his studio work, Woodson was part of ESPN's SportsCenter Special NFL training camp shows featuring the Super Bowl champion Seattle Seahawks (2014) and Dallas Cowboys (2015) alongside Kenny Mayne and Jon Gruden. Darren Woodson remains active in Dallas, Texas. He is involved in several businesses and continues to give his all, both professionally and personally, as an ambassador in his community. Woodson directly supports Teach 4 Service, an organization helping military children on their educational journey and equipping them with life knowledge and skills. Most notably, Woodson serves as board member for the North Texas Chapter of the Make-a-Wish Foundation and is a proud supporter of The Interfaith Housing Coalition and United Way of Metropolitan Dallas.